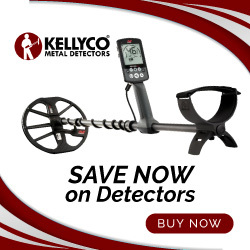 If you're reading this site, you probably either have a gold mining claim or would like to have one. The information I'm providing in this post is meant to help you file a claim. I'll only be dealing with placer claims here because with today's environmental concerns and restrictions, a lode claim or working hard-rock mine is beyond the reach of most small-scale miners like us. The subject of mining claims is well beyond the capability of Bedrock Dreams to cover simply because there are just too many details to be considered. So I'll limit my approach here to tips and suggestions. Like most of you, I'm a small-scale gold miner with limited expertise but I'm a licensed land surveyor in California and Oregon and in the last two years I've filed two of my own claims and helped a friend with another. It's been an interesting adventure, to say the least. 1) If you don't know this already, there is an abundance of publications and info relating to mining claims available on the internet. However, you still need to research the Bureau of Land Management (BLM) for specific information and material pertaining to your particular state. Read and study this material very carefully and follow all rules and guidelines. I advise you to try and make contact with a BLM employee who is friendly and knowledgeable. You'd be surprised just how many BLM employees lack even rudimentary knowledge of their own rules when it comes to mining claims. Some of these latter individuals will even try to buffalo you when you need a correct answer. 2) Once again, if you really want your own gold mining claim you need to read and research the BLM's public info on the subject. Next, get an elementary surveying text...it's not as daunting a subject as you might think and with a little reading and study you'll probably end up knowing more than some BLM employees. You'll need to understand the Public Land Survey System (sections, townships, ranges, etc.). Additionally, you'll need to have a good understanding of the aliquot breakdown of sections. 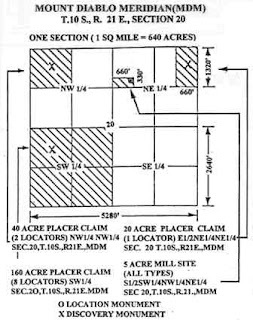 For example, a section is 640 acres (one square mile), a 1/4 section is 160 acres, and a 1/16 section is 40 acres or twice the size of a typical 20-acre placer claim. Finally, if you find yourself in an unsurveyed area. 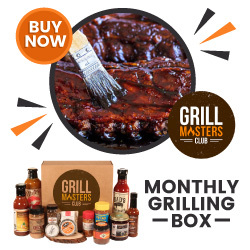 you'll need to understand metes and bounds descriptions which begin at a certain point and then commence in various directions and distances around the parcel. 3) Next, familiarize yourself with BLM quadrangle (quad) maps. These will show the townships which are composed of 36 sections per township stacked north and south. Ranges are the 36 section blocks or townships counted in and east-west direction from a base meridian. Quads will also show sections. 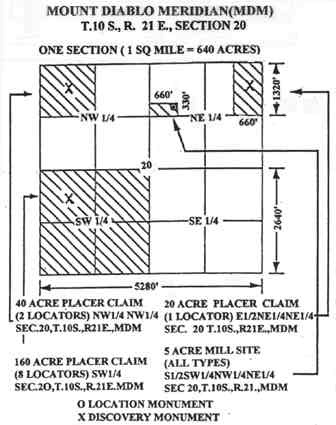 If no sections are shown on a quad, you're probably dealing with an area that hasn't been surveyed. There are a few areas in the Western states of the U.S. that are unsurveyed, but sometimes the BLM 'proscribes' sections and will provide you with a copy of their Geographic Information System (GIS) map showing where BLM 'assumes' the sections are. Then they'll expect you to describe things based on their GIS map. I suggest you not bother with trying to find a section or 1/4 section this way because they probably don't exist. When this happens, you'll need a computer loaded with a quad program to plot the latitudes/longitudes to get yourself oriented properly. If you get into a protracted section like this, you may have to to contact the BLM and the survey branch where they have a Geographic Coordinate Data Base (GCDB). Most of these surveyors are pretty good people and if you tell them your situation they'll probably just give you the the latitude/longitude of the survey points you need to break down your section to legally describe your claim. 4) Quad map programs for your computer run about $100.00 for the entire state and along with a ground positioning system (GPS) unit, you should be able to locate the area in question. As for myself, I use Maptech's Terrain Navigator Program. The state-wide quad map programs are very useful for finding old mine sites, topographic features, and access routes. You can also use them for for storing waypoints and routes and downloading them to your GPS. The learning curve here is about a day or two of practicing with it. You'll also find other BLM and/or Forest Service maps highly useful in your quest to find a claim. For about the last ten years, I have been trying to file on a claim a friend had. He has since died and the claim is open. He told me there wasn't much gold on it, but there is a well maintained log cabin and I have two of my best dogs buried there. When my time comes, that is where I would like to be as well. The BLM and Forest Circus gives me the run around, sending me back and forth and stalling it. I'm not sure I want to give these nazi's any money anymore anyway, but I'm afraid they will burn the cabin. It's much too nice for that, and I have done quite a bit of work to keep it that way. A GPS is a gadjit.....I'm not good with gadjits.....I have the old paperwork from when Don had it, but I'm not sure that is good enough now days. Not real sure what to do. As you know Gary, I abandoned my claim with a bitter taste in my mouth. However, Reily knows his stuff when it comes to claims. You want the claim with no hassles, then you have to jump through the hoops the right way. That's a fact, no matter how discouraging that may seem at times. Best, J.R.